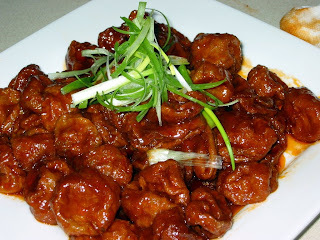 Typical dishes incorporating sweet and sour sauces are sweet and sour pork or chicken balls, sweet and sour prawns or sweet and sour stir-fried vegetable. 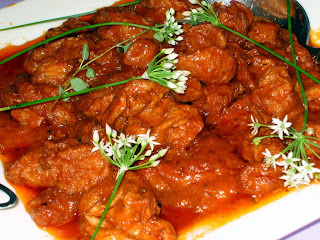 I am going to introduce Sweet and Sour Gluten Puffs which is fun to make and to eat. This dish is dedicated to all vegetarians who i hope will enjoy this dish as much as i do. Many people find combining sweet and savoury foods together a little strange for their palettes, however, the sweet and sour dishes are possibly the most popular when visiting a Chinese restaurant. Combine the ketchup, sugar, rice vinegar, pepper and salt in a small bowl, and set it aside. Dissolve the cornstarch in 1/4 cup cold water in another small bowl, and set it aside. Heat wok and pour in the vegetable stock and add in the fried gluten puffs. Cook until puffs are soft and heat through. Add the ketchup mixture and bring to a boil. Add the cornstarch mixture and stir-fry until the puffs are coated with sauce and the sauce comes to a boil again(this is to ensure that the cornstarch is cooked through).